Pot Plant Owl: 21 September and can I get some sleep please? 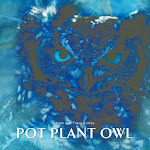 I love Pot Plant Owl. I love Pappa. And I love the fact that our balcony is theirs to use for nesting. What I DON'T love, is being woken up in the early hours of the morning with loud hooting on the balcony. From a deep slumber, the noise is enough to think you are under attack. It takes a few long seconds until your brain catches up with your ears, and you understand what you are hearing. By then, you are wide awake and the chance of sleep again in the near future is slim. Like I said, I love you PPO. I love you Pappa. But can you tone it down a decibel or three? Please? I couldn't make it without my little noise maker machine and the sound of the ocean, to drowned out the sound of the outside world. I highly recommend them.